I bought this shirt for myself with birthday money yesterday. I can’t wait to wear it. I can’t wait to see Holland. I have known about the Holland analogy of parenting since my time in special education classes in college. I’ve never really lived it. Yes, we foster parented Daniel for six years, but we weren’t really his parents (per his wishes) and he arrived at age 12, so the analogy never fully landed in my heart. 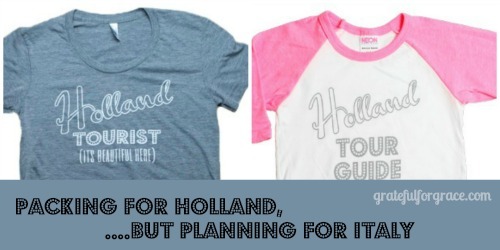 And Paul and I have advocated for Holland nearly our whole lives. As we wait for Baby Girl’s arrival, the analogy has crept back into my mind. So, as I looked on Pinterest for Down syndrome pins for lots of things I’m interested in currently, I stumbled upon this shirt. I have always like this analogy, but something wasn’t fully resonating with me. Something unsettling. I read a different blog post written by a parent of a special needs young person. She hates the analogy because she thinks it’s not accurate enough and because we “all end up in Italy”. That it’s about our expectations. I agree with her mindset in that. I fully believe that we will get to Italy. I really do believe that parenting is parenting. I’ve said that. Still, I think that Holland will be a detour for a bit. Not forever. So, I disagree with the original poem in “there you must stay”. I think Holland will be a stop for refueling, for rearranging, for some retraining. Will will be tourists there for awhile. 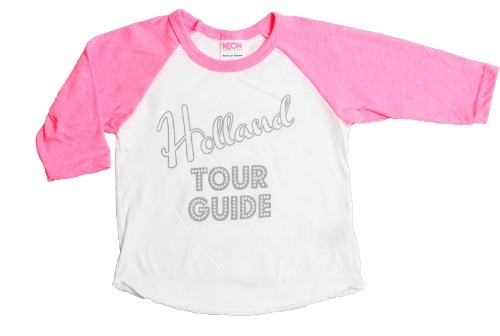 Baby Girl will be the tour guide. Tourists. Then, we will fly to Italy. That is where we will live. That’s why I love the shirt. Yes, I will be a tourist. I won’t be a resident. I won’t be changing my citizenship and I won’t cancel my trip to Italy. And it hasn’t been cancelled for me. I look forward to the trip to Holland and what I will learn there. And Baby Girl’s touring. Doesn’t the shirt rock? I hope to get this one for Baby Girl down the road. Cuteness. Seriously. Baby Girl will take us on a tour of an area we haven’t visited, though we’ve read about it, I’ve gotten a degree in it, Paul touts it, and we are excited about advertising for it. 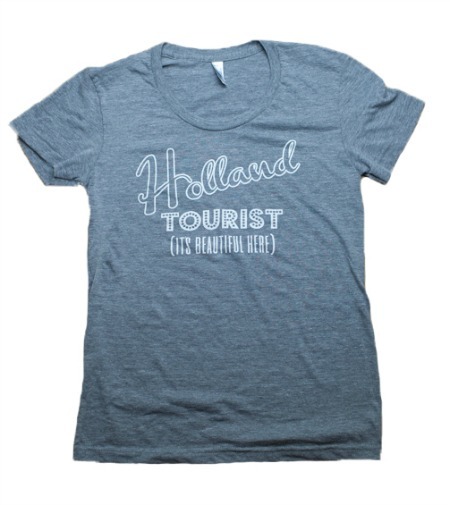 We’ve talked about Holland for decades, but only until we live there ourselves for awhile will we get it. So, we will let Baby Girl will give us a tour, we will learn, we will appreciate… and then we will go to Italy, as usual. We will be in Italy with a stamp in our passport from Holland. Have you heard this analogy? Are you living it? This is where I got my shirt… a mama to a Down syndrome son designed these and runs the shop. All of the shirts are fantastic! !